Lunan Water Diffuse Pollution Monitoring project - the first 10 years! With contributions from: Sarah Dunn, Marc Stutter, Julia Martin-Ortega, James Sample, Claire Abel, Dave Riach, Lindsay Rear, Paula Novo, Kit Macleod, Jannette Macdonald, Christian Birkel, Tom Sampson and the Lunan Farmer Focus Group, as well as staff from SRUC (Carol Christian, Bill Jeffrey), SEPA (Jonathan Bowes, Fiona Napier and others), Esk Rivers and Fisheries Trust (Marshall Halliday), Scottish Wildlife Trust (Hugh Ingram, Rab Potter and Alban Houghton) and SNH (Peter McPhail). Thanks are due to Scottish Government Rural Environment Research and Analysis Services (RESAS) for funding the James Hutton Institute part of the work through the Strategic Research Programme Waters Theme (2011-2016) and Natural Assets Theme (2016-2021). The Lunan Diffuse Pollution Monitored Catchment was set up in 2006, as a collaboration between SEPA, SRUC and James Hutton Institute. Its goals were to to assess what constitutes effective and proportionate mitigation of diffuse pollution in catchments which are (a) representative of typical land uses in Scotland and (b) where surface waters are considered at risk of failing to meet Good Ecological Status under the Water Framework Directive, as well as other regulatory targets. This has been progressed through an Environmental Focus Farm; farmer focus groups and stakeholder meetings, auditing of diffuse pollution issues; identification of mitigation measures and strategies; implementation of appropriate and agreed statutory and voluntary measures; and pre- and post-implementation monitoring for trends in water quality and ecology. Farmer workshops about diffuse pollution were arranged by SRUC during the first 5 years, and subsequently the Institute has continued hosting local stakeholder and land user workshops to promote dialogue and “joined-up” catchment management approaches to land and water issues. The James Hutton Institute research element has been running over the last two RESAS funded strategic research programmes. At the close of the current programme (2011-2016), it is an opportune time to summarise what has been learnt from the monitoring as well as from local stakeholder engagement. The main sources of SRP in the catchment are estimated to be: sewage treatment works (5%), septic tanks (5%), drainage water from land (40%), deep groundwater(<2%) and desorption from eroded sediment (45%). The septic tank distribution in the catchment has been estimated by SEPA. These are estimated to deliver 300kg to SRP loads in the river per year. Sewage treatment works (STW) total P loads have declined of the 26 year period, according to data from SEPA Arbroath, and are also estimated to contribute around 300 kg SRP/year. In both septic and STW cases, allowance has been made for uptake by plants and biofilms. Soil analysis of 66 fields in the catchment give a range of soil solution SRP from 7-273 ug/L, with an area weighted average of 94 ug/L. We assume that this average value is reflected in the drainage water from land. This gives an average of 2000 kg P/year, which varies from year to year depending on discharge. Soil erosion losses have been estimated using the Universal Soil Loss Equation for the fields in high risk crops for 2005-2009. Assuming a 120% enrichment factor for P in sediment compared with soil, much of this P will desorb from the sediment into the soluble form (SRP). We estimate this to gives about 2200 kg SRP delivery to water per year. Direct field and steading losses from livestock may also likely to be important contributors, but we have not yet attempted to quantify this. With the help of the ADAS Farmscoper Tool and farmer interviews, we hope to be able to address this gap in knowledge early in the next RESAS programme. There is evidence that post-CAP reform in 2000, when livestock manure inputs into the catchment declined strongly, the relationship between annual loads and annual discharge changes. Prior to CAP reform, higher annual discharge leads to higher annual SRP load, estimated using the unbiased Beale estimator. After CAP reform there is a negative relationship between annual flow and annual P load. This change suggests a reduction in livestock related hotspots of runoff (eg from feeders, especially for out-wintered livestock, or from runoff of slurries and manures spread at unsuitable times). The main outlet to the catchment, at SEPA’s monitoring station at Kirkton Mill, now has “good” status for chemistry according to the UKTAG (2012) classification system. The main chemistry determinand which previously caused failure to meet the “good” standard is soluble reactive phosphorus (SRP). The SRP standard for good status varies in the catchment from 24-67 mg/L depending on alkalinity and elevation. Groundwater samples at Kirkton Mill and Balgavies are close to or above the drinking water standard required for nitrate-N (11.4 mg/L) , although at Murton they are much lower (around 4 mg/L). The Loch outlet nitrate-N concentrations (annual mean 2-3 mg /L ) are much lower than those of the main inlets (6-9 mg/L), demonstrating the nitrate removal effects of the wetlands. Among the original objectives of the project were to assess the impacts on water quality of compliance with diffuse pollution regulations, such as the General Binding Rules as well as other measures and to identify cost-effective methods of pollution mitigation for the future. The project set up a nested group of monitoring stations, mainly around the upper catchment where water drains into two lochs, Rescobie and Balgavies, as well as associated rare lowland fen wetlands. Over a twenty-seven year period (1987-2013) the flow weighted SRP concentration at Kirkton Mill first increased from 60 to 133 mg/L then declined, first rapidly, then more slowly, to its 2013 value of 32 mg/L. Over the shorter periods (2006-2014) during which a range of sub-catchments have been monitored by the Institute and SEPA, there is no downward trend in SRP and some of the smaller sub-catchments show significant upward trends (Auchterforfar and Murton for example). There is a downward trend in nitrate-N at most sites with the exception of the Balgavies Loch and Gighty and Vinny water outlets. The downward trend in SRP at the Lunan Water catchment outlet is also shown in the Rescobie Loch Total P concentration. This is mainly due to a reduction in the frequency of anoxic conditions in the Loch in summer, causing release of SRP. This has led to a reduced frequency of algal and cyanobacterial blooms, and occurrence of N limitation in the Loch at some times. The presence of increased amounts of Elodea canadensis (Canadian pondweed) has led to the fishermen’s association on Rescobie Loch (RLDA) maintaining a macrophyte harvester to clear areas for fishermen and their practice of adding straw bales to the water may have contributed to the declining incidence of cyanobacterial blooms. A proposal for a NERC resource recovery from waste project (REBALANCE)to manage this material for recycling to land, by Stirling University, was unsuccessful. The trophic diatom index estimated from diatom species/genus counts for stream biofilm scrapes in spring, summer and autumn over 4 years showed no obvious trends with water quality or time. The lower part of the Lunan Water is downgraded because of morphology (due to barriers to fish cause by weirs) and low flows (due to abstraction for irrigation). Monthly water level data on Balgavies Loch show a clear upward trend in water levels. In contrast to river discharge, there were significant trends in annual maximum (slope= 0.77cm per year, s.e.=0.446,p=0.046) and minimum (slope= 0.65cm per year, s.e.=0.195. p=0.011) water levels over the monitoring period (2003-2014). This trend suggests more use could be made of the water to alleviate low flows downstream in summer. The problem of sediment in the lower catchment, exacerbating flooding issues at high flows. This has led to the development of an Environment Co-operation Action Fund proposal for control of sediment losses in the upper catchment. This would promote the uptake of rural Sustainable Drainage Systems (rSUDS) in the catchment, now funded by the Scottish Government. Two examples of rSUDS have been installed in the catchment, on the Mains of Balgavies farm. A design manual for installing rSUDS is in preparation as a CREW project led by Abertay University at present. The problem of incomplete reporting of abstraction to the regulatory body, SEPA. This probably leads to a tendency to over-correct for abstraction in estimating low flows, so better reporting by licence holders might facilitate improvements in the ecological status of the lower Lunan Water. Ecological status of the water course is currently based on licenced rates. A proposal to introduce a tilting weir, to improve management of high and low flows, in place of the existing fixed structures, was discussed at the workshop, and the riparian owners of one potential site have expressed readiness to consider this, if evidence of buy-in by downstream users were obtained. There could be potential for a Payment for Ecosystem Services approach to funding and managing such a scheme. Further weight to support such an idea was provided by recent floods, which exacerbated flooding of riparian fields upstream of existing barriers to flow. See the new PESLES project webpage at Payment for Ecosystem Services. We have focused mainly on the reduction of sediment loads associated with high risk crops on sloping fields. This work has included the development of a novel sediment fence technology which uses large porosity geotextile fabrics to retain sediment, while allowing drainage water to discharge more quickly than with a conventional bund or wetland, and also allowing flexibility of timing and placement to “hotspots” where problems occur. In collaboration with SRUC, two rSUDS devices have been installed in the catchment.This made use of modelling work by SEPA (Jonathan Bowes) to underpin an SRDP application to build a bund in a riparian field on the Environmental Focus Farm. 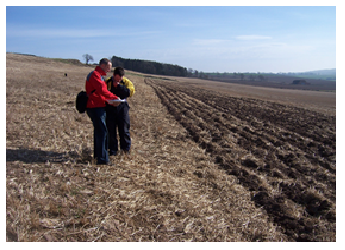 James Hutton Institute have also been developing a modelling approach () to assessing the potential impact of rSUDS on sediment delivery to water from the >1800 fields in the catchment. This uses simplified field geometry, linked to erosion and sedimentation modelling, to identify key sites for implementation of rSUDS, sediment fences or targeted “greening” of the catchment. Examples of some fields in a high risk crop (potatoes) where the contours on which a sediment fence would need to be installed, are shown here. This approach allows the likely costs and effectiveness of individual diffuse pollution mitigation measures, on a field scale. Identification of the potential for sediment mitigation delivered by rSUDS, along with costs information derived from grants under the new Scottish Government Agri-Environment Climate Scheme enables us to carry our cost-effectiveness analysis for sediment and sediment bound P mitigation at the scale of the catchment. An example of an analysis of the costs and effectiveness, as a function of the level of mitigation required to achieve a target reduction in P loads in the catchment is shown here. The results show that mitigation of sediment bound P, through edge of field rSUDS and other measures, is competitive with the costs of mitigation of septic tank and sewage treatment work losses (typically £15-£35 /kg P). They are also competitive with societal willingness to pay for P mitigation, as identified in previous work at national scale. A new tool (SUDZ-xy) for cost-effectiveness analysis of field scale sediment-bound phosphorus mitigation measures has been developed. The tool can be used to carry out spatial and temporal targeting of mitigation measures at field scale across a catchment, to deliver target reductions in export of sediment or sediment bound P to surface water. Andy Vinten, James Sample, Adekunle Ibiyemi, Yakubu Abdul-Salam and Marc Stutter (2017). A tool for cost-effectiveness analysis of field scale sediment-bound phosphorus mitigation measures and application to analysis of spatial and temporal targeting in the Lunan Water catchment, Scotland. Science of the Total Environment (http://dx.doi.org/10.1016/j.scitotenv.2017.02.034). Outputs are: cost-optimized choice of measures across a catchment to deliver target reduction in sediment-bound P loads; cost-curve relating costs and mitigation of P loads; potential to link to GIS display of optimized measures on field-by-field basis across a catchment. An appraisal of the economic benefits of improved availability of water for irrigators at low flows has suggested that these benefits will outweigh the costs of infrastructure and management of a tilting weir system to mitigate the impact of low and high flows in the catchment. New RESAS programme plans (2016-2021). Our plans for the new Scottish Government Funded work in the catchment, as part of the Natural Assets theme Work Package on Water Resources and Flood Risk are still under development. They will focus on promoting physical implementation of sediment mitigation measures to improve water quality and mitigate flooding, assessing their impact on the ground, and identifying and assessing financial and governance instruments that facilitate delivery of these improvements, for example through Payment for Ecosystem Services. One aspect of this new work has been to assess the impact of including point sources and internal loch sources of P in the analysis of cost-effectiveness of measures to achieve reductions in P pollution loads to the Lunan Water. This work is reported here. As part of the Water and its ecosystem functions delverable we are evaluating the sources, impacts and management of fine sediments in rivers.Part of this work, led by Andy Vinten and Luigi Spezia, is exploring turbidity ime series data to try to find ways of describing the fine sediment contribution. An internal presentation summarising the work to end March 2017 is available here. Work in which in-situ turbidity was calibrated for assessing sediment and P transport (Dunn et al., 2014; Stutter et al., 2017) has shown that turbidity sensors can improve temporal knowledge of river mass loads, and calibrations were improved by splitting rising and falling hydrograph periods. Example plot of % variation in Total P, Particulate P and suspended solids accounted for using turbidity data, when flow, rise/fall of hydrograph and temperature are also considered. Data are for 3 subcatchments on the Lunan Water,Angus, Scotland. However, calibrations for one catchment were not transferable to a neighbouring catchment, and this suggests that we need to do more “data mining” to identify when fine sediments, more heavily enriched with adsorbed P, are being transported. This should help improve transferability of calibrations. One possible approach to this is to use a latent Markovian process to classify the data into hidden states, and relate these to time-dependent triggers for transport of fine sediment such as enhanced erosion of fine cohesive particles at high flows, or enhanced mobilisation of fines by raindrop impact at high intensities. This Bayesian modelling approach allows the analysis of non-linear and non-stationary time series with an auto-regressive component. The method uses a probabilistic framework to assign each observation to a ‘hidden state’ that could then be linked to different controlling factors or processes. A Markov switching autoregressive model (MSARM) was used to analyse a time series of turbidity data from the Baldardo Burn, Lunan Water Catchment, Angus, Scotland.